Funnily enough, that particular song has been shoehorned into Lucy Simon’s very different sounding music, as an anthem for the battlefield nurses to sing, as if it were perhaps a Russian folk song. Though Simon’s score is, on first hearing, not so well matched to the material as her work for “The Secret Garden,” it is good enough not to need an interpolation of a song most people nowadays probably don’t even remember. The show is, for the most part, performed on such an overamplified level (SCK Sound Design) that most of it registers as an unpleasant assault to the senses. But listening at home to some of the tunes (“Now” and “On the Edge of Time”) on YouTube (performed by the Anthony Warlow from the Australian cast) but sung intimately in a recording session, I was able to hear that there are, in fact, some very pretty melodies here. Perhaps if the current production generates an album, allowing one to listen to it at a more comfortable level, the beauties of the score will be more apparent. For now, the spectacle on stage is laughably derivative of “Les Miserables” and any number of other of the British/French mega-musicals. A duet for Yurii Zhivago’s wife Tonia (Lora Lee Gayer) and his lover Lara (Kelli Barrett) has thematic echoes of “I Know Him So Well” from “Chess.” Yurii’s affirmation of his name brings to mind the main character’s similar declaration in “Martin Guerre.” But these occasional similarities aside, Michael Korie and Amy Powers’ lyrics are simply banal. 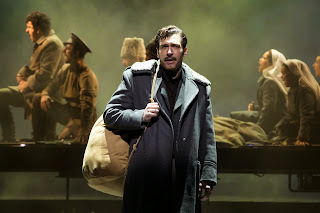 And “Doctor Zhivago” is nowhere near as good as its Victor Hugo-inspired model, a hugely more compelling stage piece. The first act is full of too much incident, wartime chaos, gunshots, and explosions. The second is more comprehensible as the story focuses more on the triangular love story. Tam Mutu in the title part of the idealistic doctor/poet is excellent, both dramatically and vocally, and at least provides a sympathetic focal point for all the frenetic action around him. Barrett sings nicely, but hardly evokes the sympathetic qualities that made Julie Christie so special in the film. Gayer fares much better, but her part as the wronged wife is perhaps more sympathetic. Paul Alexander Nolan, though occasionally too strident for his manic character, has some strong moments as Lara’s activist husband-turned-dictator Strelnikov. And Tom Hewitt is strong as Lara’s lustful suitor Komarovsky. Visually, Michael Scott Mitchell’s designs are pretty dreary, though in fairness, the narrative doesn’t lend itself to bright, cheerful colors. Paul Tazewell’s costumes seem to fit the bill. Director Des McAnuff handles his cast well, but fails to provide much fluidity to Michael Weller’s episodic book, each scene -- whether the last days of Czarist Russian, the Russian Revolution, or World War I and beyond -- introduced by a clunky (though, I suppose, necessary) supertitle above the stage. And the use of projections (like a giant image of Lara) is often just plain tacky. 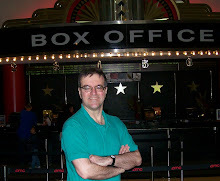 At the end of my performance, as the audience was filing out and the orchestra was playing the exit music, a lengthy and deafening electronic mishap had everyone covering their ears in dismay and scurrying up the aisles, a somehow fitting conclusion to the previous three hours.